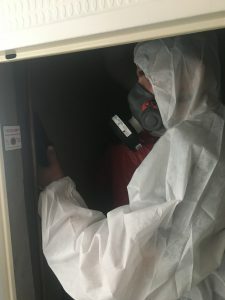 An asbestos survey plays a valuable role in any asbestos management plan and allows you to better understand your property’s predicament and how to handle it. You must ensure the surveyor is professional and competent in their role to avoid oversight or any inaccuracies. Therefore, it is strongly recommended you use only the very best and most experienced asbestos surveyors. Here at Esoteric Environmental we provide a professional, systematic and affordable solution to your asbestos survey needs – every time! Our team of surveyors have decades’ worth of experience and will ensure your assessment runs as smoothly as possible. What’s in the Asbestos Survey? Here at Esoteric Environmental we offer asbestos surveys and removal/refurbishment/management services at very affordable prices. The team here all have extensive experience working on a number of different property types, from large factory buildings to small commercial outlets. We are able to offer an extremely quick turnaround time, from initial inspection right through to the final report. Completing a professional asbestos survey will then enable us to successfully develop a management plan for your property; working in-line with government legislation and guidance. Having such a solid asbestos management plan in place will allow for easy removal services too, if they are required. The whole survey team here at Esoteric Environmental are qualified to British Occupational Hygiene Society standards and have years’ worth of experience inspecting properties; ranging from small houses to large industrial sites. Check out our projects page for more information and insight into the work we have done in the past. Contact us today on 01603 280 868 or 07919 100 734 for more information or to obtain a quote for your premises.